Even for the most confident students taking an oral exam can be quite stressful. Twice a year, in June and September, I assess students’ speaking abilities acting as both an interlocutor asking questions and interacting with students, or an assessor listening to students’ performance. 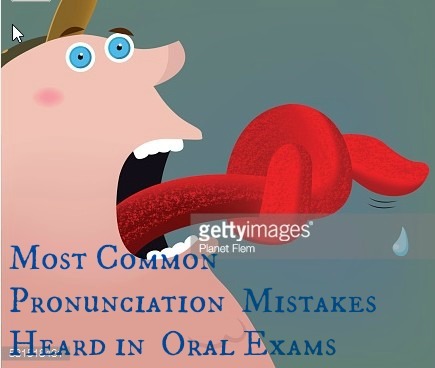 It was while acting as an assessor that I decided to write down the most common pronunciation mistakes students make with the intention of going over them ,with my own students, at the very beginning of the course. I have created a quiz with, what I hope, will be the last I see of these pronunciation mistakes. I hope you find it useful! Thank you for the quiz. It’s really helpful. Hi Sonya! I’m glad you find it helpful! I love this tool. It is very helpful!! It was useful but if it’s downloadable we can use it for students. Unfortunately this tool does not have a download button. You can only share it or embed it! Yes, it is a tool with a lot of potential for language teaching. Thanks for dropping by! I am trying to study English, and I would really love a video with the correct pronunciation. It is interesting and useful post!! Thank you very much Cristina. Sorry to be pedantic, but number 7 is wrong – there is always a /j/ sound in verbs like studying and bullying. Thanks for your comment Andrew. I agree that sometimes a /j/ glide is heard at a point of front vowel hiatus where the first vowel is /iː/ or /ɪ/ but it is also true that generally it is so relaxed that such a glide is not heard. I really enjoyed this and learned a couple of things as well. Oh Thank you! I am glad you enjoyed it! Great post, Cristina, as always! I’m sharing it with my students. We are dealing with mispronunciation of some words so they’ll love this quiz. Keep up the awesome work you’re doing in your blog. Congratulations on the award!!! Thanks a lot! I am thrilled that you like it! Thanks a lot, it is so helpful mostly when we are not native speakers. We need more of this kind of exercises in your blog. A big hug from peru. I enjoyed the course very much. I was very helpful. Thank you. Cristina, thank you for your blog. I find it very useful because I’m learning a lot from this site. I’m glad you you find it helpful! thanks, i like the quiz to much, it’s really useful!